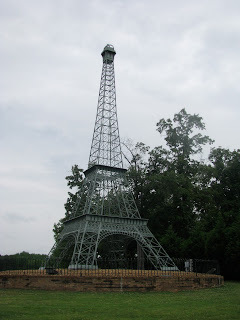 Took a side trip to see the Eiffel Tower in Paris.....Paris, Tennessee, that is, not far from Mitch’s house. We’ve been getting ready and departure day came quickly. Mitch's dog, Abby, has been practicing riding in her new stroller. She seems to like it. Abby got a haircut for the trip. Poor thing, I don't think she liked that, but has forgiven Mitch by now. Sarah came to visit and give us a good send-off to Alaska. This is her new RV, "Magic." You always eat well at Mitch's...healthy too. We took our rvs to get weighed. I'm still underweight, can you believe it? And I traveled the Great River Road to Pere Marquette State Park. This mural was in the town of Alton. I didn't know the significance of this painting high on a cliff when I snapped this photo. I learned about it later at the state park. You will too. From a distance, I thought this big barge was an island. Once settled in my campsite, I walked around by the Visitor Center. This statue of Mother Nature was by the Lodge. Pere Marquette was honored too. Entrance to the Lodge and Convention Center. Apparently many Bald Eagles winter here at the confluence of the Illinois and Mississippi Rivers, but they have all migrated on now. We'll have to catch up with them in Canada. But there were several families of Canada Geese down by the river. The Park Superintendant's Office is housed here. 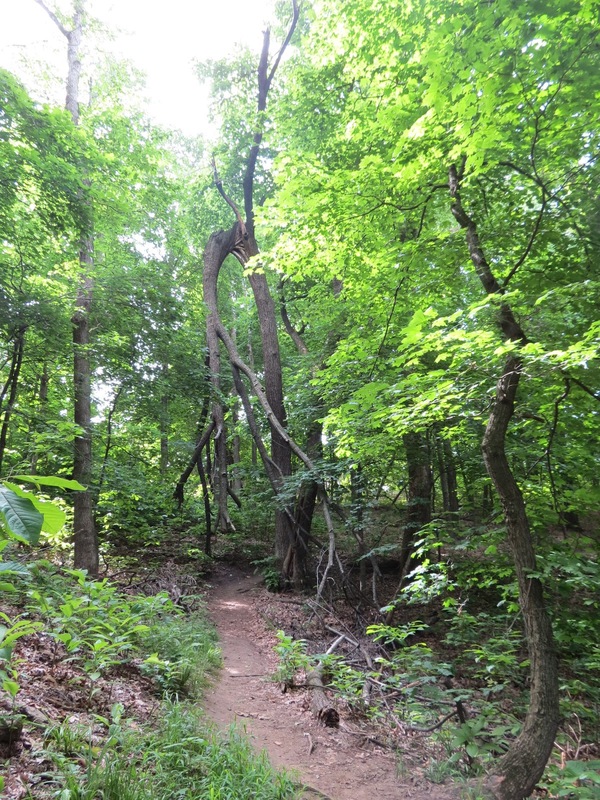 I took a short loop hiking trail from the Visitor Center parking lot. There are several others and a long bike trail along the River Road. How Illinois got its name. This mural in the Visitor's Center depicts the arrival of Marquette and Joliet. And I learned the legend of the Piasa Bird...remember the painting on the cliff along the River Road? This is the way Marquette recorded it in his journal. Local indians painted the original and it depicted the subject of a legend about a large man-eating bird that inhabited the area....can't remember the whole story. Saturday morning I took another hike on the "Goat Cliff" Trail to the top of the bluff overlooking the river. Started out easy enough. Sometimes I think I should pay more attention to why they name trails as they do. Top of McAdams Peak, 372 feet above the river. McAdams was a Professor studying the local indian tribes, and in 1892 removed 100 indian skeletons and other artifacts for the Smithsonian Institution...a controversial thing to do today. Couldn't figure this bird out...need help. It was perched atop a tree below McAdams Peak. Returned to the Visitor Center via the "Ravine Trail", another aptly named trail. Found a tick on me tonight. Hummingbird at a feeder by the Visitor's Center. Nan drove in mid-afternoon Saturday. we went for a bike ride on our twin bikes. Sunday morning, Mitch, Nan, and I are on the road. We didn't do too bad....just missed one turn, and that gave Mitch a chance to practice backing her trailer to turn around. She did good! We were the only campers in this County Fairgrounds campground in Missouri Sunday night. Good going you intrepid ladies! Lots of fun just starting. Have safe journey and keep an eye in the rear view mirror for Herschel, Stuart and Remi and remember them may be dragging Tina with them. Oops forgot the bird - it looks 'finchy'. Doesn't look much like a warbler. will try to research tomorrow or the next day. Thanks so much for sharing your journeys with us, Liz. I thoroughly enjoy reading about your adventures, and the pictures help me capture the feelings behind the words. I'll be looking forward to each post as you make your way north. Safe travels, friend. Wonderful post as always Liz. I have been waiting for the next "installation" of your travels. See you are still "underweight" so you are doing great. How did Mitch do on her weigh in? Hopefully good so she can quit stressing about it. Can't wait until you all meet up with Birdie and Tina joins you too. Glad to see Mitch out and running w/ ya'll! keep the pictures coming!!! enjoying the heck outta them! Ooooo and Ahhhh moments for the Canadian Glacier Highway.